The fixed-roof MGB GT was introduced in October 1965. Early prototypes such as the MGB Berlinette produced by the Belgian coach builder Jacques Coune utilized a raised windscreen in order to accommodate the fastback look. In the end it was Pininfarina that produced the design for this sporty "hatchback". Their ground-breaking ‘greenhouse’ design brought together the utility of an estate car while retaining the style of a sports coupe. By combining the sloping rear window with the rear deck lid a 2+2 design for a new type of car was born, and 15 years the 'hot hatch was all the rage. The right-angled rear bench seat might not have been the most luxurious of seating but it was functional, folded flat it allowed far more luggage space than in the roadster. Much of the ‘mechanics' of the MGB-GT were the same as the roadsters although along with the larger windscreen it did also have different springs and anti-roll bars. Being heavier than the roadster performance is not as good, but, top speed benefited from the better aerodynamics of the closed body rising to 105 mph (170 kph). 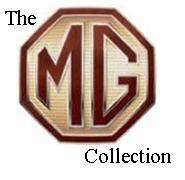 The MGB was to be one of the longest model runs in MG History despite changes to US emissions laws effectively ended the MGB-GT in America, exports to the US stopped in 1974, but in Britain production continued until 1980. For men of a certain age the MGB-GT remains the version that captures the imagination. In 2013 Ian came across this kit in an already started state and was able to buy it for a fraction of the cost of a new kit. That said the kits is a very fine piece of model engineering, lovely details and a great fit of parts. As the engineering was by SMTS (Scale model technical services) this isn't surprising but to have so much detail and nickel plated parts at the price is. White Metal prices have risen a lot lately but this kit, with all it's fine details, remains very reasonably priced. Sadly the instructions and vac-formed windows were missing but Ian got around it due to experience and a little scratch building. Apart from the windows the model is built straight from the box. The Primer used was Alclad II which went on well followed by 'True Blue' from the Americana range which seems to match well. Both of these were applied with an airbrush, Halfords clear acrylic top coat to finish off and we have a lovely looking car. Some of the bright work (bumpers and grill) is plated in the kit, then some is bare metal foil but some is done by 'planishing' the kit metal and covering it with Johnson's Klear. In this case the planishing doesn't mean hammering the surface flat but rather smoothing it off to a shine by rubbing another, harder, metal on the surface. Ian used some needle nose tweezers to rub the parts to a shine.